He’s spotted a skylark. The soundscape is silence and skylarks and meadow pipits and his feet on heath and heather and lush, black bog. It is the beginning of June 2005, and before the month is out the Black Mountain will be open for the first time to the people. Terry Enright slowly turns 360 degrees. “I’ve never seen this before,” he says. “It’s never been so clear.” What he sees is Scotland far over to the east, and the Isle of Man, and when he turns inland there is Lough Neagh – the biggest lake in these islands – five of the Six Counties and Donegal on the west coast. Down below is the bowl of Belfast. “The people of Belfast never saw this. 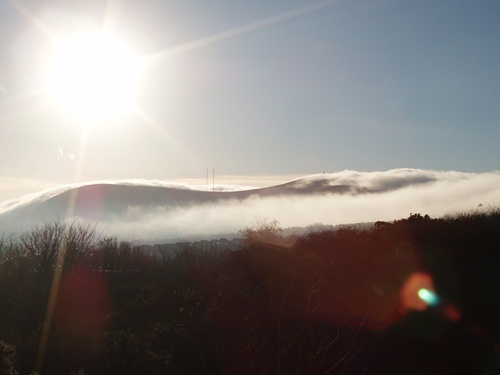 They live here but it’s not been part of their life.” Enright lives here, too, on a Ballymurphy council estate nesting at the bottom of the mountain that skirts the city skyline. But he made it his mission to move around the mountain. Where he was happens to be one of the most exhilarating transitions between town and country. Terry and Mary Enright, activists much loved in Belfast, look up from their Dermott Hill front door to a place more than a thousand feet high, and they can be up there in minutes. That was before the Troubles. The Belfast Hills – Divis, White Mountain, Cave Hill and the Black Mountain – became not so much a war zone, as a zone emptied of the people down below. That leaflet given by Terry Enright to the soldier explained that there was a great movement to rescue the Black Mountain, both from the military and from quarry and construction companies. In a political context “dominated by the orange and the green”, a context still “substantially dysfunctional”, according to Gray, Enright is also known as an artful coalition-builder who brings working-class class to environmentalism. Since 1990, when he became outraged by the quarrying that was gorging on the mountain and then stuffing the holes with waste, Enright has enlisted people from both posh civic-heritage campaigns and hard Catholic and Protestant estates to “walk the walk”. Then, following the Good Friday Agreement, the MoD’s “private property” was bought by the National Trust. 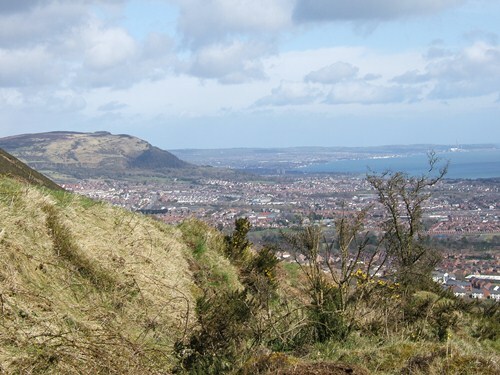 Together with Belfast Hills Partnership, the trust will act as steward to the mountain. Already, environmentally friendly paths have been laid across the cap of the Black Mountain, before it finally opens to the public this summer; and “difficult” children being educated out of school have removed 1,500 discarded vehicle tyres from it. But nothing has yet stopped the quarrying of the 80-million-year-old hard basalt lava out of which the mountain is formed, or the dumping of waste into the canyons this leaves behind. And over on White Mountain, a revolt is brewing in Castlerobin, a hamlet squeezed between the sites of two “superdumps” used by quarry companies to bury most of Northern Ireland’s waste. Apart from the hazard to the mountain and its people, this practice now requires the evacuation of a colony of newts that have made the quarry their home. The case signifies new expectations of politics created by the peace process, and a sense that in new times the Belfast Hills must move on to the political radar. They may have been there for 55 million years, but they are neither above nor beyond trouble. Terry Enright looks from the road down to Belfast, back over the Black Mountain. There’s a sprig of stones on the horizon, a cairn created by dispossessed kids in Belfast in memory of his son, Terry Og (young Terry), a gifted Gaelic footballer and a cross-community youth worker. He was shot during the spree of loyalist killings that preceded the Good Friday Agreement. Terry Og’s young widow, Deirdre, and her uncle, Gerry Adams, the Sinn Fein president, were among the pall-bearers that ugly, bleak day in January when 10,000 people – including a posse of Shankill teenagers – joined the dead man’s cortege. Suddenly, the rain stopped and the sun shone. There was a noisy hush: a rainbow leaned across the city to the Black Mountain. Beatrix Campbell is a writer, broadcaster, campaigner, playwright and Green Party candidate. You can find out more about her work, including links to her books, plays and articles, on her website. This entry was posted in Places, Reflections on April 5, 2012 by Paul Scraton. I have just re-read this vivid article by Bea Campbell about Terry Enright RIP – his earthiness, power, leadership, inspiration. And then I went back to your recent pieces about Belfast, in light of Terry’s recent passing. Thank you Paul for posting – this is the power of your blog: to bond people, place, passion together. It’s captured the beat, the landscape of Belfast, and given us a sense of the man.